In addition to offering off-site programming within Spokane's West Central neighborhood, Spark Central provides access to a variety of innovative tools, technologies, and creative resources within its public space, located at 1214 West Summit Parkway. Spark Central is currently open to the public Tuesdays through Saturdays from 12:00 – 7:00 pm. In addition, Spark Central hosts a number of community programs in the facility during the times that it is not open to the public. The following section will provide an orientation to the different areas within Spark Central, as well as a checklist of opening and closing procedures. Within this section, you will find a photo tour of the Spark Central space and information on the different resources available in each area. Use this information to find out what we have and where everything is located - then go explore for yourself during your next shift! You may also want to try out the practice activities below. Whether they're looking for creative reference materials, DVDs, or the latest children's fiction, visitors are sure to find it in our Library area. Even if reading's not their thing, visitors can spend a quiet afternoon curled up in a comfy chair working on projects, playing table games or enjoying the gorgeous view. The stage area is popular with younger kids and is often used for educational programs and presentations. It contains art and craft supplies, children's books, toys and pillow fort-making equipment! A combination of Mac and PC computers are located along the East wall of the facility. These computers host a variety of software and gaming applications including: ??????? A virtual reality station can be set up using Computer 9 (beside the front windows). The VR equipment is stored against the wall beside this computer. 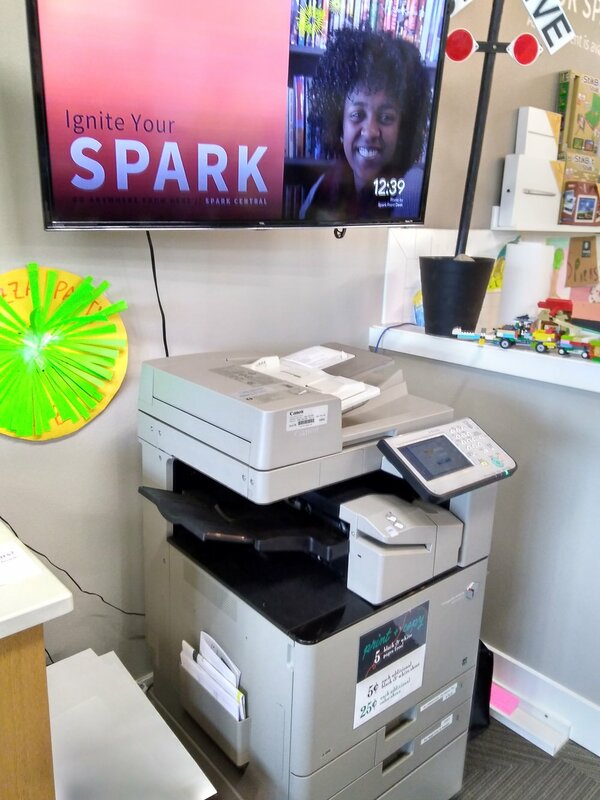 Within the Volunteer station you will find the library terminal (volunteers only), photocopier/printer, and phone as well as the bulk of our mobile electronic devices. See the Volunteer Station photo tour below for more detail on the items found in this area. The kitchen area houses a sink, coffee pot, kettle and dishes for staff/volunteer use. Snacks for visitors are stored in the upper cupboards and you will find cleaning supplies below the sink. The wall across from the cupboards holds a bulletin board with volunteer information, time sheets, and pegs to hang your coat/bag. The storage room at the end holds larger items (e.g. Mindstorm Robotics kits) and additional supplies. Materials to be found within this space include: art and craft supplies (paper, scissors, fabric, string, tape, glue, markers, pencil crayons, stamps/ink), paper cutter, stapler, paper clips, computer components, chalk, playdough, Lego pieces and various related odds and ends. The Tech Kits displayed in this area are actually stored within the cupboards under the front counter of the Volunteer Station. Various technology kits (Ozobot, Little Bits, Miposaur, etc. ), a cash float, and remote controls can be found in the cupboards beneath the front counter. iPads, headphones, power cords, chargers, computer mice, microphones, and a variety of adaptors, etc. are located in the right side cabinet. An office-scale printer/photocopier is located in the corner of the Volunteer station. Members can print up to 5 black & white pages for free - each additional copy is 5 cents/sheet. Color copies are 25 cents/sheet. The Library terminal is located at the end of the front counter. It is for volunteer use only. Membership forms and staff business cards are located in holders on top of the front counter and directly behind the terminal. 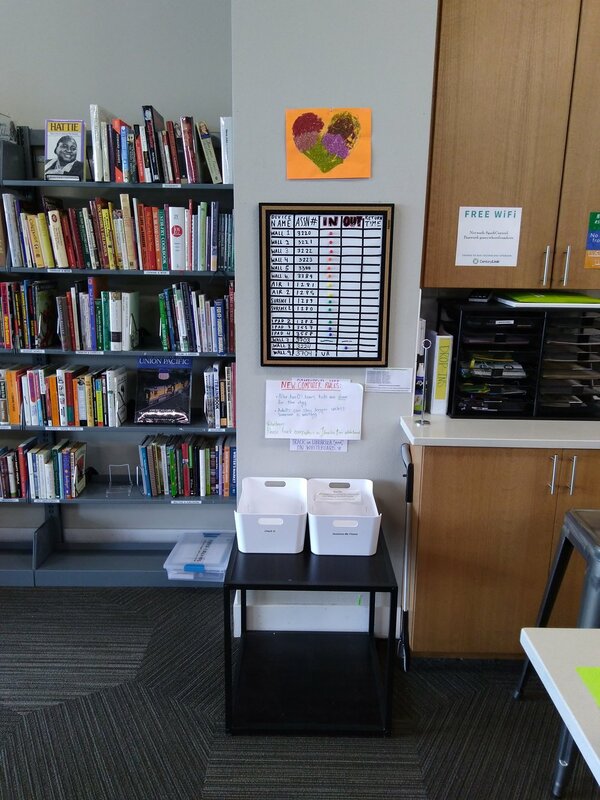 Completed membership forms are located in the file basket on the back counter, while printer paper, envelopes, VR head gear and accessories, bicycle locks, and office supplies are in the back cupboards. A sign out board on the back wall records which computers, tablets and laptops are in use. 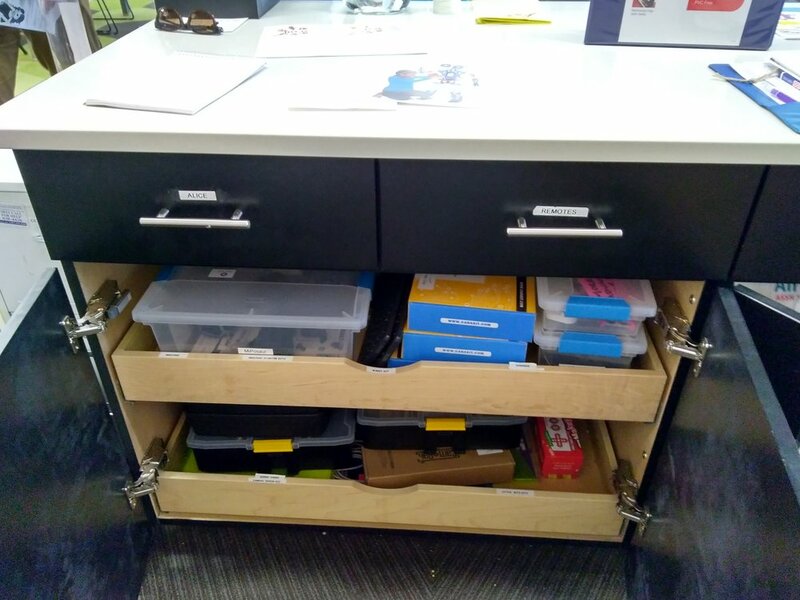 A new cabinet, located below the sign-out board, holds laptops and surface pro tablets. Baskets for library resources that need to be checked in or filed are also located here. Gloria and her three children, ages 6, 10, and 12 are on their first visit to the facility. The youngest, a little girl aged 6, is interested in art and stories; her brothers, ages 10 and 12, like building things and creating comic books. Based on what you know is available and the interests they have expressed, make a suggestion around an area of the facility to explore and/or an activity that might interest each of them. Charlie wants to create a poster for his school play. What equipment and/or resources would you suggest he use? Franklin is looking for work and wants to search job boards and update his resume. What equipment and/or resources would you suggest for him? This section outlines the steps you will need to take to properly open or close the facility. Often several of these steps will be taken care of by staff before you arrive or after you leave – but just in case they aren’t, we’ve included the whole procedure for you here.